This week's burger is one that I just sort of dreamed up. The idea came to me when I saw a package of those delicious Hawaiian rolls in the grocery store last week -- you know the ones I'm talking about, right? The sweet ones? I love those rolls, and I wanted to use them for some type of burger. A slider packed with Hawaiian flavors seemed like the perfect fit -- literally, as it turned out. These mini burgers were just the right size for the amazing rolls. Joe and I both liked these a lot. The burgers are sweet and spicy at the same time, and I think the crunchy macadamia nuts and creamy pineapple mayo balance each other perfectly. Some cilantro would have been delicious in the mayo mixture; I may add that next time I make these. 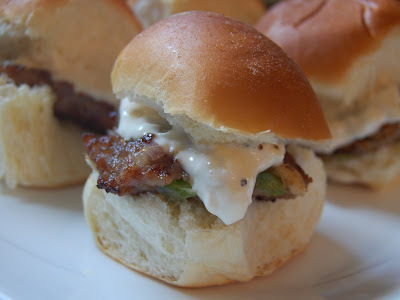 Amazingly, Joe, Andrew and I polished off 11 out of the 12 sliders this recipe makes. These little burgers are definitely packed with big flavor! 1. In a large bowl, combine first nine ingredients. Separate burger mixture into four equal-sized sections, then separate each section into thirds to make 12 sliders. Cook over medium heat in a large skillet until cooked through. 2. Meanwhile, combine mayonnaise, crushed pineapple and salt and pepper in a small bowl. Chill until serving. 3. Place one slider on each roll bottom. Top with a dollop of pineapple mayonnaise, then the bun tops. What a cool idea, Cassie! Love the creativity, and I agree that the little Hawaiian rolls are awesome!